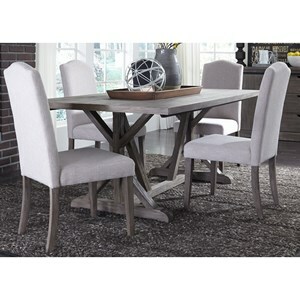 Constructed with fir solids and veneers, this dependable and charming trestle table will incorporate warmth and charm into any room. 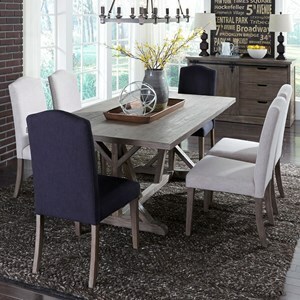 Boasting a modern-farmhouse look, this staple dining piece is wire brushed to give it that weathered gray finish, and the intricate design of the two pedestals adds to its overall character. 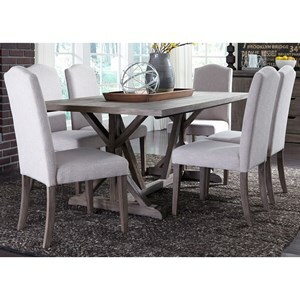 The Carolina Lakes Trestle Table with Weathered Gray Finish by Liberty Furniture at Hudson's Furniture in the Tampa, St Petersburg, Orlando, Ormond Beach & Sarasota Florida area. Product availability may vary. Contact us for the most current availability on this product. 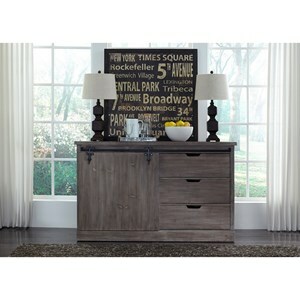 The Carolina Lakes collection is a great option if you are looking for Rustic furniture in the Tampa, St Petersburg, Orlando, Ormond Beach & Sarasota Florida area. 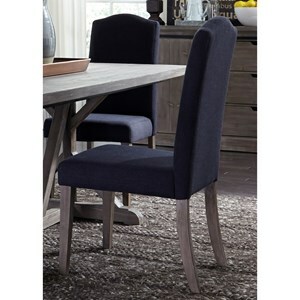 Browse other items in the Carolina Lakes collection from Hudson's Furniture in the Tampa, St Petersburg, Orlando, Ormond Beach & Sarasota Florida area.